The short deck and lightweight design can be used on many machine sizes. Using the powerful brush cutting action of the dual offset blades, the Brushcat rotary cutter mulches small branches and saplings — up to 3 in. in diameter — and cuts through the thickest grass and brush. And all while maintaining the proper power-to-blade ratio. The Bobcat rotary cutter has been built by keeping the high standard of their users in mind. This cutter can be used for multiple purposes and applications in agriculture, parks and recreation departments, and construction sites. The design is built with precision that suits a wide range of machine sizes. It is durable, lightweight, and easy to handle. In diameter, the Bobcat rotary cutter can cut up to 3 inches and also cuts through the thickest and the most stubborn grass blades. The rotary cutter cuts like butter through bushes and weeds. The power-to-blade ratios are maintained with the help of a powerful brush cutting mechanism. The dual offset blades cut saplings and branches with precision and much ease. 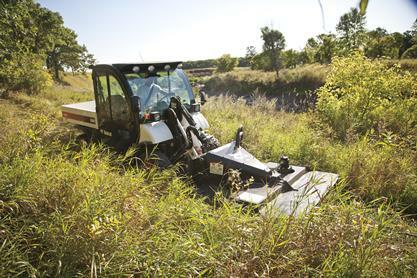 The Bobcat rotary cutter takes care of the most challenging brush cutting projects, and maintenance is not difficult. You can either maintain it yourself or you can call the professionals are Bobcat who can assist you professionally in your equipment services. Bobcat’s services are incomparable. There is no brand like Bobcat in the construction market today. Customers who have experienced Bobcat products, services, rentals, and sales would all vouch for their high levels of durability and performance. Velocity Fuse(on select models): Integrated into the valve, the velocity fuse safeguards the hydraulic system and limits potential damage. If the hydraulic capacity of the motor is exceeded, the velocity fuse will shut off the hydraulic flow to the cutter, providing a definite uptime advantage.